There is a large area north of Tahoe in the 6-8 inch range. 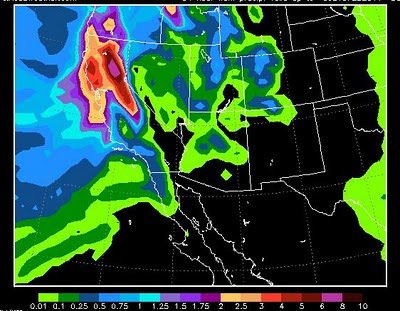 The northern parts of Tahoe could be looking at nearly 6 inches, while south of the lake is looking around 4 inches. That should translate to 3-7 feet from south to north Tahoe, over the crest. This storm has increased in size and intensity. Dangerous winds for the leeward areas of the Sierra (Arrow Creek, Galena, Washoe Valley) will increase as the storm approaches. Right now it looks like Reno could get between 1-2 inches of precip. I am guessing that the foothills may pick up as much as a foot of snow starting very late tonight. If you wake up tomorrow morning and it is not totally white, then we dodged the bullet in the valley and were shadowed by the Sierra. However, I am guessing this thing will spill over and bring at least moderate snow (3-5 inches) to the valley floor just in time for the morning commute. If the wind dies down enough, tomorrow could be an epic day on the mountain with a few feet of fresh pow by morning and heavy snow all day long. I believe by Saturday a weak ridge of high pressure moves in, which means warmer temps and blue skies before the next series of storms comes into blast us.